Peter Frampton was born in Beckenham, England, in 1950. 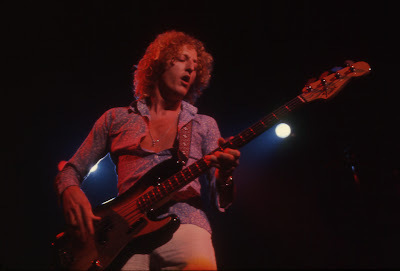 He attended Bromley Technical School in London (becoming friendly with another student, David Bowie), and got an early start in his musical life, becoming well-known as a teenage member of The Herd, a British band now remembered for a handful of hits that included "From the Underworld," "Paradise Lost," and "I Don't Want Our Loving to Die." 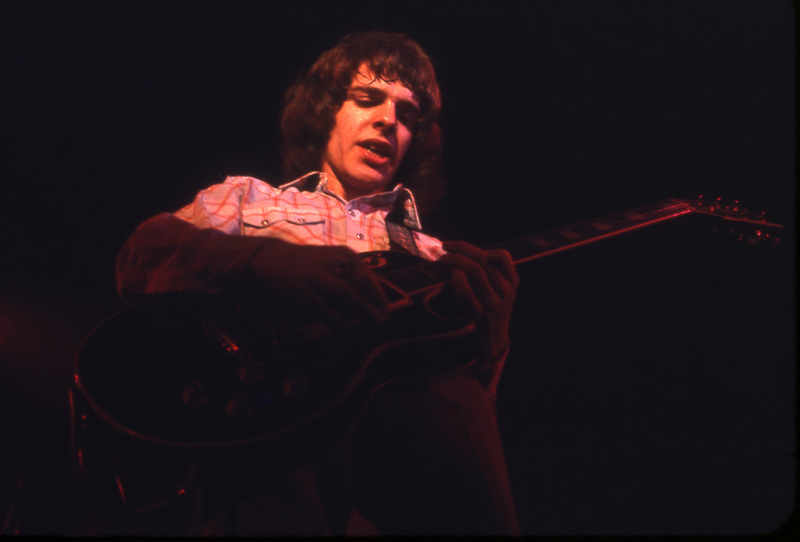 Peter Frampton himself received most of the fame, being dubbed "The Face of 1968." 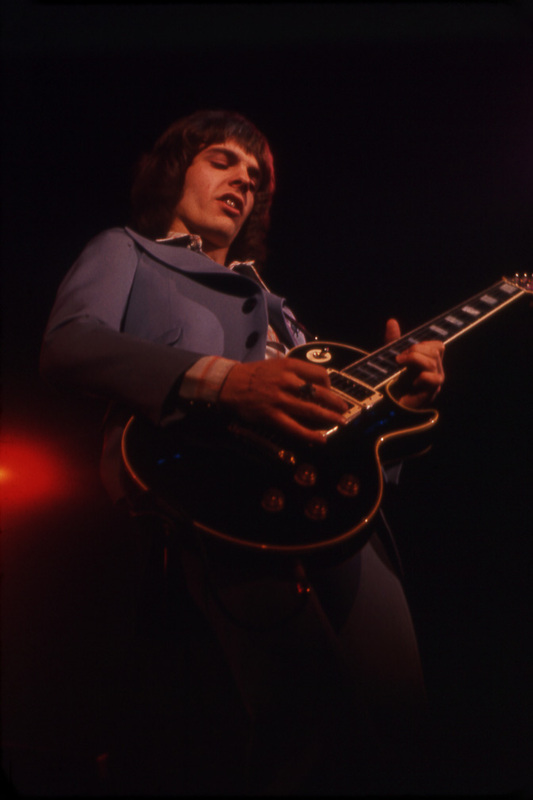 In 1969, Peter Frampton quit The Herd and joined with Steve Marriott, who had parted company with The Small Faces, to form Humble Pie. Being in a new band allowed Peter Frampton to stretch his abilities, increasing his standing as a serious musician and strengthening his confidence as an aspiring songwriter. 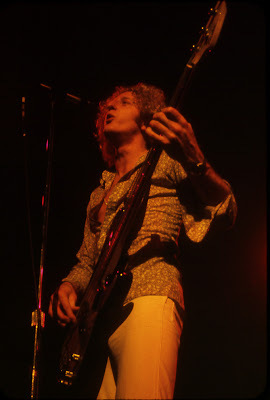 With Humble Pie, he was able to put his years as a teen pinup behind him, establishing a new reputation as a tasteful purveyor of jazzy licks. He also gained praise for his exciting showmanship. 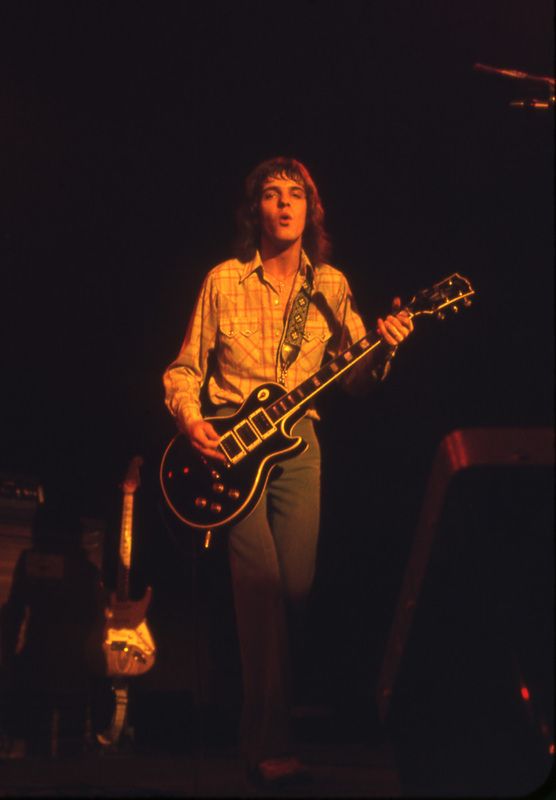 Peter Frampton left Humble Pie in 1971, determined to write and perform his own songs. His first album under his own name, Wind of Change, featured nine of his compositions, in addition to a cover of "Jumpin' Jack Flash." 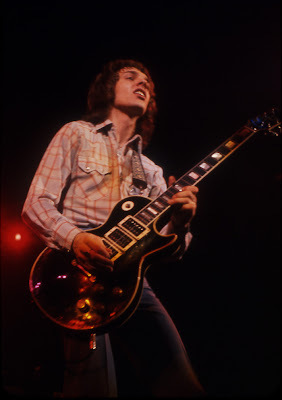 He soon went out on the road with a new band, known as Frampton's Camel, playing frequent gigs and steadily building up an extensive following. In time, his willingness to work hard, combined with his good looks and the tuneful infectiousness of his music, would begin to pay substantial rewards. In March of 1974, when Peter Frampton appeared at Winterland, he still was trying to make his way to the top. His band on that evening included Rick Wills on bass, John Siomos on drums, and Andy Bown (also a former member of The Herd) on keyboards. 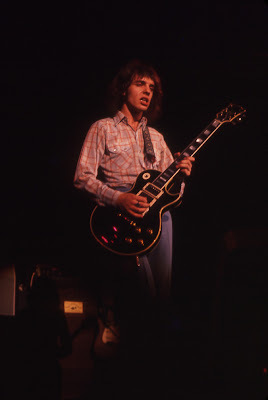 Although Peter Frampton clearly was the main figure and the unquestioned leader, each musician in the band made a distinct and valuable contribution to the overall sound. 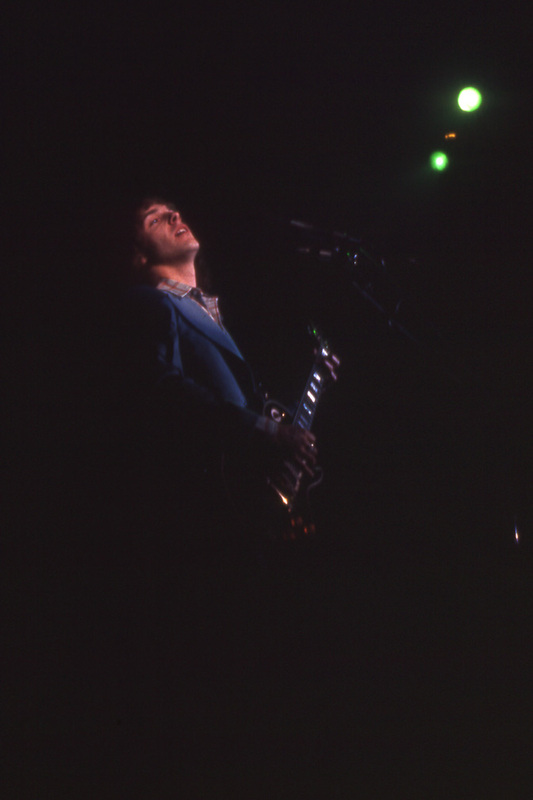 On stage at Winterland, Peter Frampton gave a winning performance, displaying the full range of appealing qualities that would transform him into a major star when his live album, Frampton Comes Alive! (which was partly recorded during a later appearance at Winterland), was released in 1976. From the beginning of his set (which opened with "It's a Plain Shame"), he was both cheerful and charming, self-assured without appearing to be cocky, using his voice and his guitar to bring out the warmth in his songs. David: R.E.O. Speedwagon opened the show. I don't remember much about seeing them. At the time I wasn't interested in their music. The Doobie Brothers were the headliners, but we were there to see Peter Frampton. We left after his performance. Being anti-dope, seeing a group nicknamed "The Doobers" went against our sensibilities. 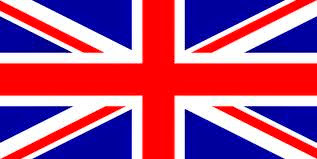 Besides, they weren't British! I loved Peter Frampton's first solo album, and also the second album with his band, Frampton's Camel, which had a harder edge. The songs were memorable and well crafted. I still own those two albums. I think they are his best work. 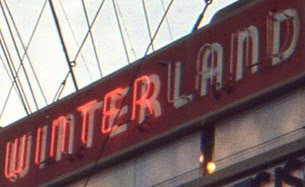 At Winterland he did songs from both, but also was debuting songs from his third album, Somethin's Happening. The keyboard player from the first two albums, Mick Gallagher, was gone. Michael recognized his replacement immediately, and told Gary and me that it was Andy Bown, from Frampton's first group, The Herd. I remember the excited look on Michael's face when he told us. I made an effort to get a picture of Andy Bown. One turned out very dark, but I managed to get one of him in the spotlight, adding vocals. It was always hard to get good pictures of keyboard players. We had the best possible spot to see the show. Peter stood right in front of me, giving me great opportunities to get pictures of him, and also of the bass player, Rick Wills. This concert was one of my favorites. The music was powerful and Peter Frampton was a dynamic performer on stage. 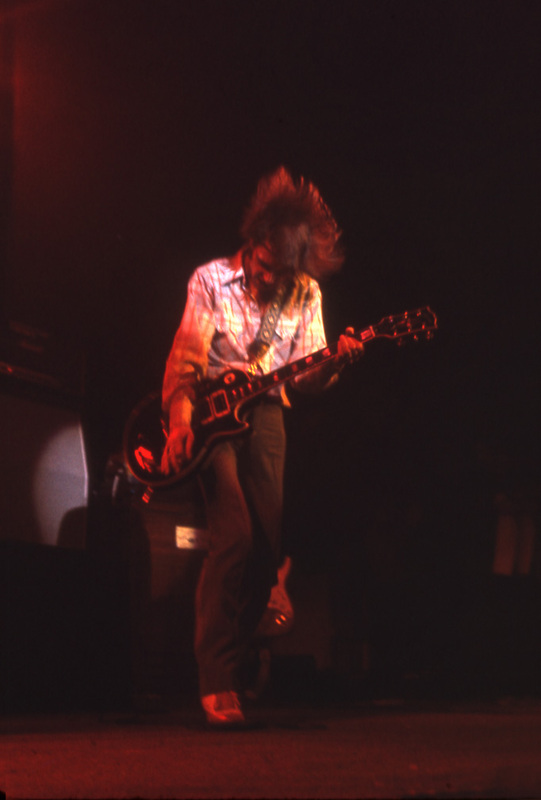 His guitar solos stood out as among the best that I ever heard. Any thoughts of him being just a "pretty face" were quickly pushed aside. He could really rock! The last song of the set, "Jumpin' Jack Flash," built to a frenzy. 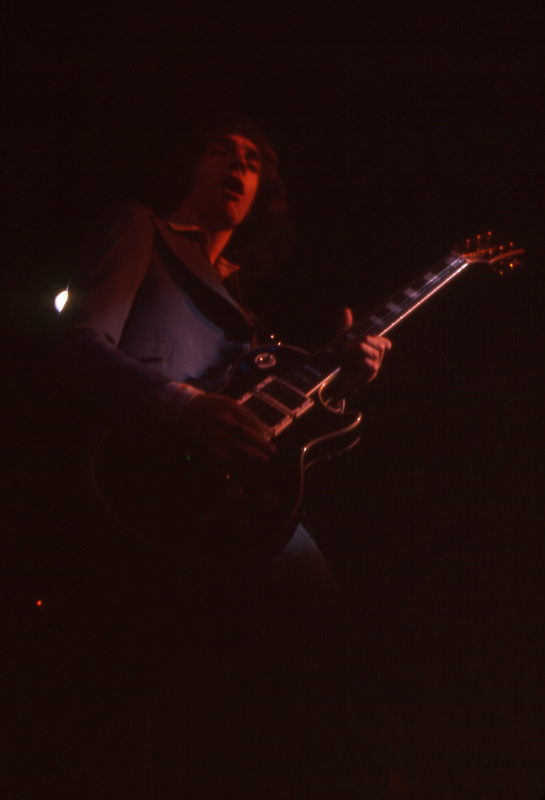 I can still remember pointing the camera at Frampton to get a shot of him as he played the last note. His head went down as his hair went up. I clicked at the split second that he hit the final chord. I didn't know what the picture would look like, but I was quite pleased later, when I saw how I had captured the action. As we waited outside to meet Peter Frampton after his set, I could hear The Doobie Brothers playing "Jesus Is Just Alright." Today, I regret missing their performance. Peter came out and politely gave us his autograph. He seemed to be in no hurry to leave, so I had a chance to talk to him a bit. Still feeling the excitement of his performance, I asked him if he was going to do a live album. I like to think that I gave him the idea for that. I saw him two more times, once just four months later. We drove from the Bay Area to Sacramento for that one. Gary: The Beatles or The Rolling Stones? Traffic or Black Sabbath? Bing Crosby's "White Christmas" or Billy Idol's "White Wedding"? 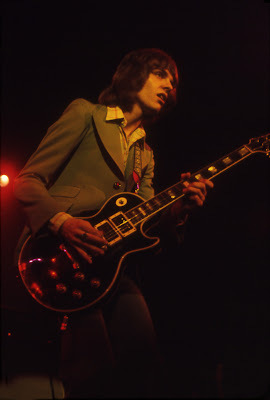 Peter Frampton or Steve Marriott? The differences in the ways of creating were incredible, and the contrasts in the characters of the people making rock music in those days, was simply amazing. 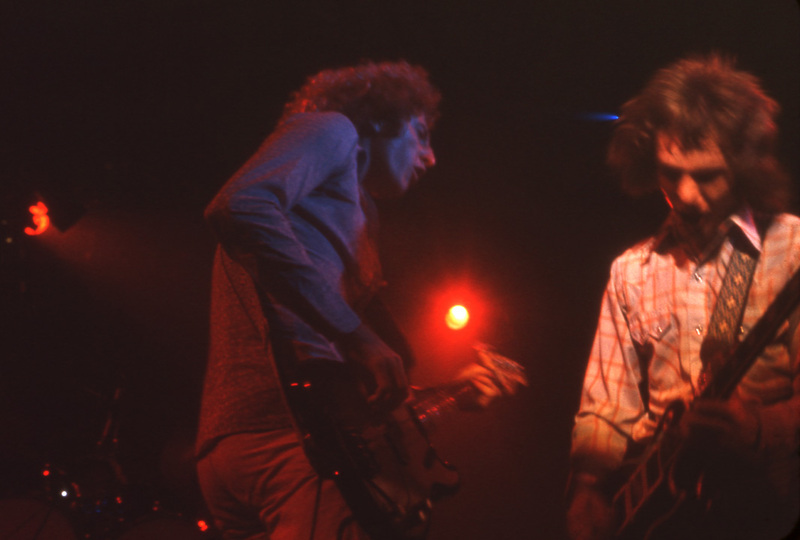 It sort of seemed that Steve Marriott wanted to take Humble Pie to a darker place, and Peter Frampton wanted to take things to a lighter place, and once he left the band, they both gravitated freely to where their personalities took them. I enjoyed both approaches equally. Music was so great in those days because of it all. I didn't hear much then about jazz influences in rock music. Aside from Pete Townshend saying that he admired Barney Kessell, only Peter Frampton mentioned jazz in an interview (although I'm sure there must have been others, I just don't remember reading them), saying that he really liked Kenny Burrell. 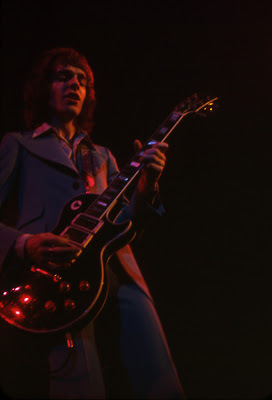 Peter Frampton played a very nice black Gibson Les Paul. I liked Peter Frampton a lot, and I agree with Dave that his first two solo albums were well crafted and wonderful to hear. I also agree that he could really rock with the best of them. His playing on Humble Pie's Performance Rockin' the Fillmore was blistering, and really pushed Steve Marriott at times. I had a Herd LP, but I don't remember it and sold it back along with the only Andy Bown LP that I ever found. I wish my friends would have been more successful in talking me out of selling so much back. It would be nice to listen to those LPs today. 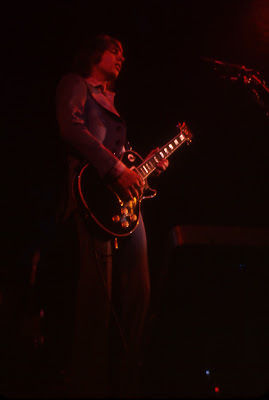 I really liked Peter Frampton's playing and songwriting, as well as his stinging, yet melodic lead guitar at the concerts, where he really stretched out. Perhaps he used the talk box a bit too much at the end, but even that was inventive, the way he communicated with the crowd as his fingers manipulated the strings and supplied the melody. A lot of talent in that man. 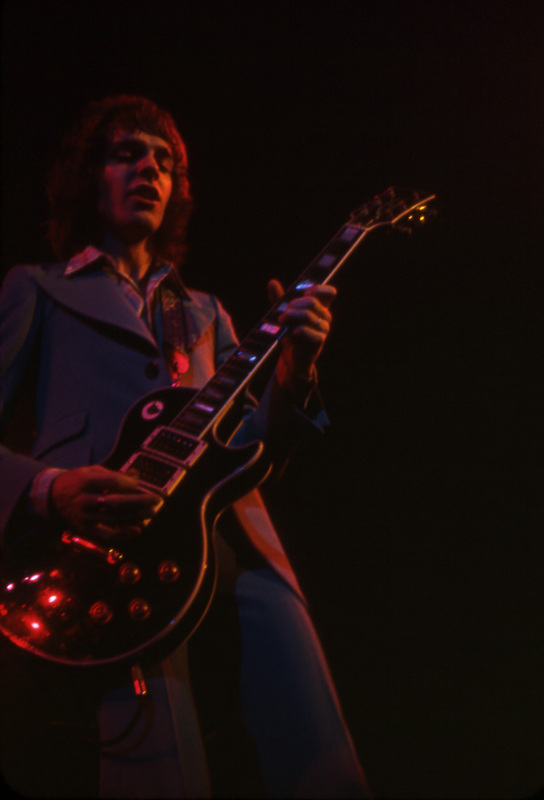 Michael: In those days, Peter Frampton had it all: great songs, great musicianship, great clothes, and great hair. I remember being particularly impressed by his well-groomed appearance and the way in which he carried himself on stage. He was everything that a British musician of the early 1970s was presumed to be. He was not at the top of the bill that night at Winterland, but he clearly was a star in the making. His style as a guitarist leaned more toward jazz than blues, setting him apart from other British guitarists of the time. He played each number in a polished and thoughtful manner. The entire performance was worthy, but when he did "Lines on My Face," a gently melancholic song from his second album, it was a special highlight for me. He put that one across with deep feeling. 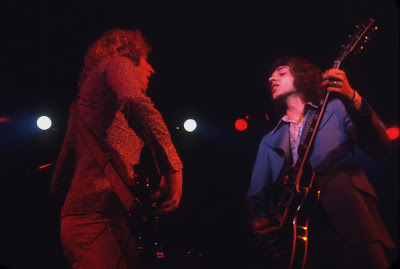 Seeing Peter Frampton and Andy Bown performing together again was special, too. When we spoke to Peter Frampton at the stage door after the show, he was approachable and unaffected, and seemed quite willing to talk with anyone. He had an unusual degree of charm. I remember him now as one of the friendliest musicians that I have ever met. 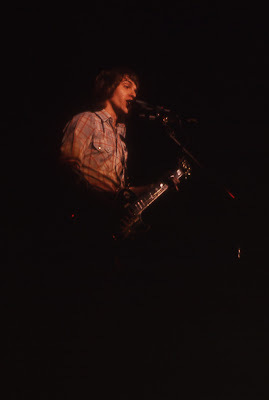 Firse concert I ever saw - age 16 - went to go see Peter Frampton too rather than the Doobies, though we stayed for the whole thing - read an article where he said he was inspired by Django Reinhardt. Peter turned my whole outlook, and guitar playing on its ear...teaching me about a melodic style of rock soloing that had never really been heard before! My teacher at the time, was Sir Richie, with his 'snake charmer,' and diminished licks thrown in. They totally fascinated me! But Peter's ingenious use of the melodic minor scale totally turned me in another direction, which has served me well over the years! I was at that show! It was my very first concert, I was 12 years old. My next concert was Pink Floyd in Jersey City. Ironic that Andy Bown would leave Frampton just as he was on the verge of becoming the biggest Rcok star on the planet. Always wondered about that - he went back to England, and after a year or so of doing solo stuff landed right into a British Rock institution that alas, never made it here in the states (outside of "Pictures of Matchstick Men" and "Rocking All Over the World") - Status Quo. Ironic too, that he has been with Quo for almost 35 years now. my first concert too! went for the doobies, liked reo, was blown away by frampton. established my winterland spot at that first show-up front, stage right, just in front of the huge speakers. i would sit inside them and look around the corner to watch the show. security was pretty lax. 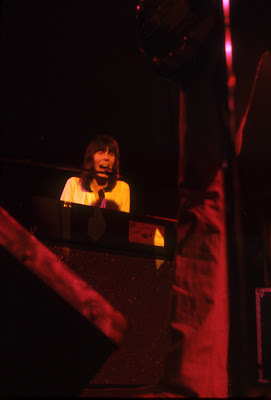 i remember the rumor in the bathroom-among the people puking in the sinks and those doing lines of coke-was that nicky hopkins was playing with frampton. andy bown was great though, and he played with frampton several more times at winterland. i need to look through my kodak 110 pictures. if you got pictures of the crowd up front to your left, there i am-shorter, thinner, with much, much more hair. love your site. I was at this concert we drove clear down from Humboldt State in Arcata. Gas was being rationed in California so that was tough. REO speed wagon was great! Frampton was absolutely incredible and played forever, the Dobbie Brothers were really great and didn't come on until after 1:00 a.m. I was tripping on acid and remember lots of people puking in the girls bathroom. I would have to say this ranks up there as on of the best concerts I ever went to!